about the Amazing Almond Butter Crunch (also known as Almond Roca). It took my daughter and I a couple of rounds to perfect it, as this can be a tricky thing to make, especially without a candy thermometer. But, we did it! And it turned out AMAZING! It’s so yummy and crunchy, I can’t stop eating it! I had to start writing this post so I would stop eating it! (one pet peeve of mine is eating at the computer). There is more than one way to make this, the most popular is on a cookie sheet/in a cake pan. 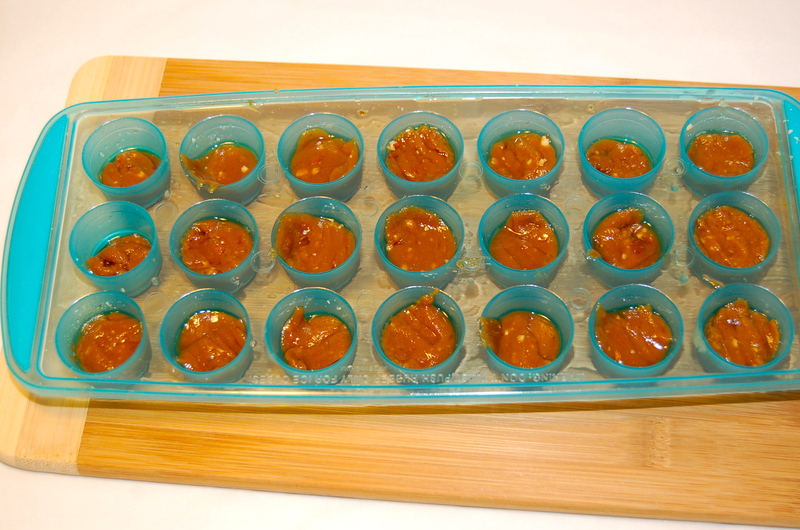 We decided to do something different though, and used ice cube trays with a silicone bottom. Many of the recipes we found on-line used a lot of butter. We used less butter… and it turned out amazing. In a medium pot, melt the butter over med-high heat. Once the butter is melted, add the sugar. Start your timer & stir constantly. After about 1 minute, the mixture will get bubbly and thick. Turn the heat down to medium. Continue to stir constantly for about 2 more minutes. Remove from heat when the mixture looks smooth and creamy – like melted caramel (as in picture above right). Remove right away if you start to smell it burn a little. (If you have a candy thermometer, it should reach a max of 290 degrees.) Keep stirring while off heat and add in 1/2 cup of the crushed/chopped almonds. The mixture will harden rather quickly, so you need to move fast. Pour the mixture into the ice cube trays and let it harden. Ours took about 15-20 minutes to harden. 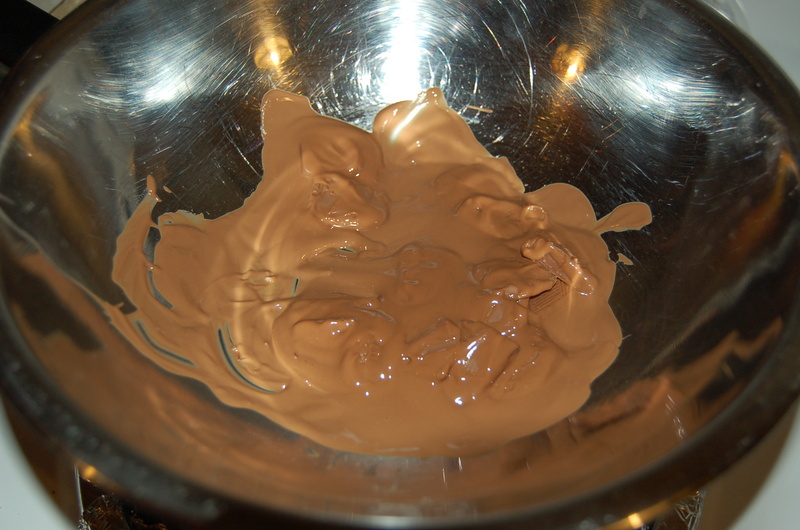 Melt chocolate (I used a metal bowl over top a pot of boiling water). Sprinkle some crushed almonds on a plate or on some parchment paper. Pop out pieces of butter crunch out of the ice cube trays and dab them off with a paper towel. Dip them into the chocolate and place on the crushed almonds. Sprinkle more crushed almonds on top. Voilà! Enjoy & try not to eat them all at once! 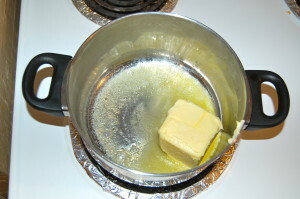 1) In a medium pot, melt the butter over med-high heat. 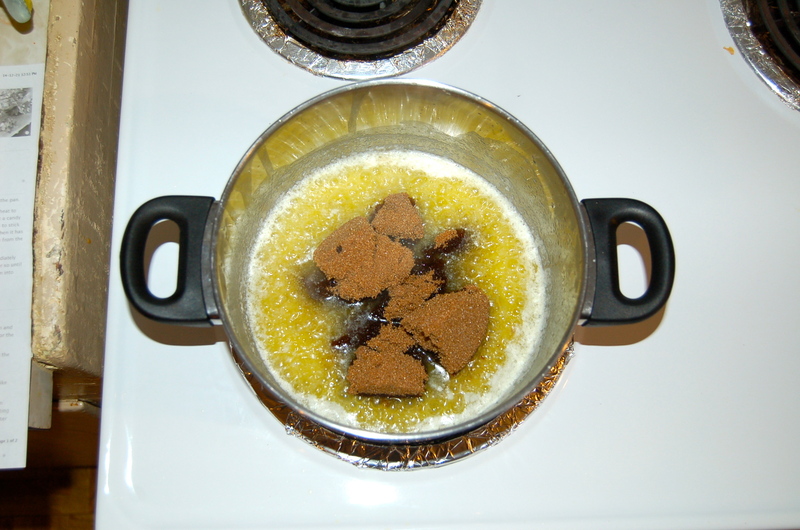 Once the butter is melted, add the sugar. Start your timer & stir constantly. After about 1 minute, the mixture will get bubbly and thick. Turn the heat down to medium. 2) Continue to stir constantly for about 2 more minutes. 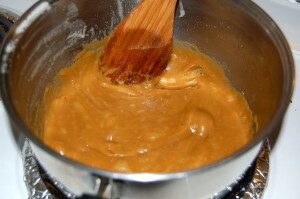 Remove from heat when the mixture looks smooth and creamy - like melted caramel (as in picture above right). Remove right away if you start to smell it burn a little. (If you have a candy thermometer, it should reach a max of 290 degrees.) Keep stirring while off heat and add in 1/2 cup of the crushed/chopped almonds. 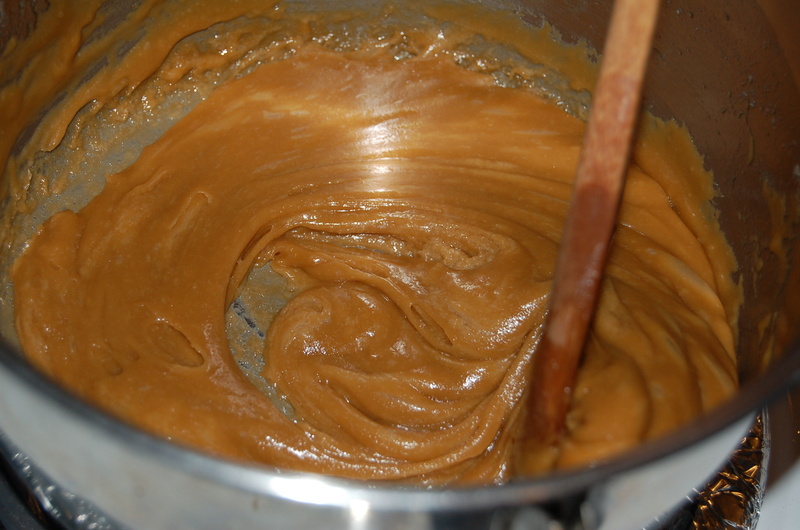 The mixture will harden rather quickly, so you need to move fast. 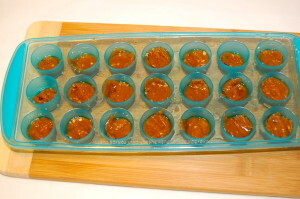 3) Pour the mixture into the ice cube trays and let it harden. Ours took about 15-20 minutes to harden. 4) Melt chocolate (I used a metal bowl over top a pot of boiling water). 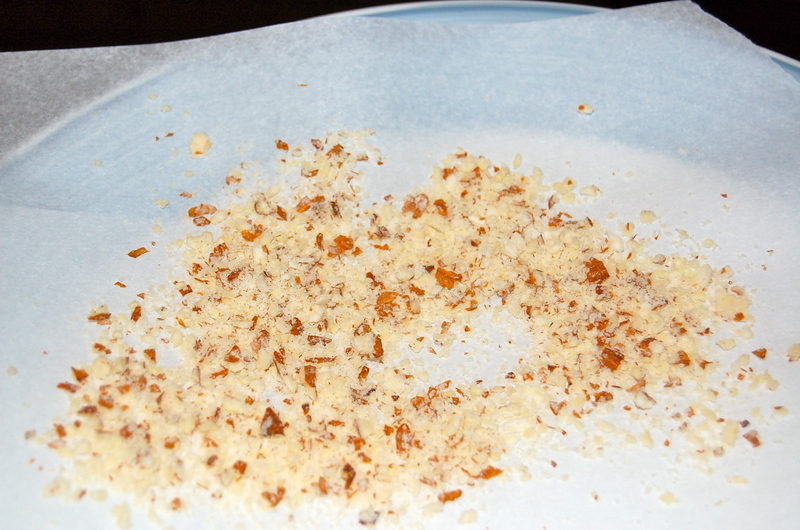 5) Sprinkle some crushed almonds on a plate or on some parchment paper. 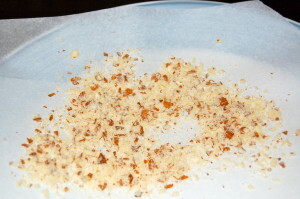 6) Pop out pieces of butter crunch out of the ice cube trays and dab them off with a paper towel. 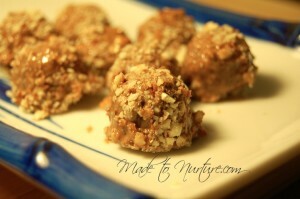 Dip them into the chocolate and place on the crushed almonds. Sprinkle more crushed almonds on top. Let chocolate harden. You can put them in the fridge if you want the chocolate to harden faster. **Crushed/chopped almonds** The easiest way to crush/chop your almonds, is to take a wide blade knife and place the flat side of the knife on top of an almond or two. Press down to crush, then chop the almond if you desire it to be more finely chopped. 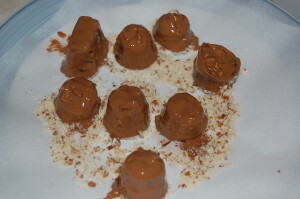 **Cook time: less than 5 minutes for Almond Butter Crunch mixture; approx 5 minutes to melt chocolate.